In this episode the Maisel Goys are joined by special guest Ben Siemon (@BenjaminJS) to gab all about Episode 209 - Vote For Kennedy, Vote For Kennedy! Yedoye Travis (@ProfessorDoye) joins the Maisel Goys to gab all about Episode 207 - Look, She Made a Hat! Caitlin Weierhauser (@UncleCait) joins the Maisel Goys to gab all about Episode 206 - Let's Face the Music and Dance! Carrie Rosen (@carrierosen) joins the Maisel Goys to gab all about Episode 205 - Midnight at the Concord! Hrishikesh Hirway (@hrishihirway) joins the Maisel Goys to gab all about Episode 203 - The Punishment Room! Anthony Troli (@anthonytroli) joins the Maisel Goys to gab all about Episode 203 - The Punishment Room! Julia Prescott (@juliaprescott) joins the Maisel Goys to gab all about Episode 202 - Midway to Midtown! We're back! Kevin T. Porter and Alice Wetterlund join forces to bring you The Marvelous Mrs. Maisel Goys! Guy Branum (@guybranum) joins the Maisel Goys to talk all about Episode 108 of The Marvelous Mrs. Maisel - Thank You And Good Night. In this special episode of Maisel Goys, we talk to Jordana Silverman (@jmosilverman) all about Jewish culture on The Marvelous Mrs. Maisel! Georgea Brooks (@georgeabrooks) joins the Maisel Goys to gab all about Episode 7 - Put That On Your Plate! Carrie Rosen (@carrierosen) joins the Maisel Goys to gab all about Episode 6 - Mrs. X at the Gaslight! Alison Rosen (@alisonrosen) joins the Maisel Goys to gab all about Episode 5 - Doink! Plus we talk to listener Chloe Issac (@chl_oeee) about her experience watching the show! Veronica Osorio (@verovidetta) joins the Maisel Goys to gab all about Episode 4 - The Disappointment of the Dionne Quintuplets! Jamie Lee (@TheJamieLee) joins the Maisel Goys to discussion Episode 2 - Ya Shivu v Bolshom Dome Na Kholme! The Gilmore Guys recap the series finale of Bunheads and bid a fond farewell to the podcast. Thanks for listening. Ben Siemon (@BenjaminJS) joins the Bunhead Bros to gab all about Episode 14 of Bunheads, The Astronaut and the Ballerina. Erin Mallory Long (@erinmallorylong) joins the Bunhead Bros to gab all about Episode 12 of Bunheads, Channing Tatum is a Fine Actor! Kevin & Demi read emails and listen to voicemails. Brock Wilbur (@brockwilbur) joins the Bunhead Bros to gab all about Episode 11 of Bunheads, You Wanna See Something? Carrie Rosen (@carrierosen) joins the Bunhead Bros to gab all about Ep 10 of Bunheads, A Nutcracker In Paradise! Jamie Woodham and Anthony Troli (@jwoodham @anthonytroli) join the Marvelous Mrs. Maisel Men to gab all about the pilot! Mara Wilson (@MaraWilson) joins the Bunhead Bros to gab all about Ep 9 of Bunheads, No One Takes Khaleesi’s Dragons! Jamie Woodham (@jwoodham) joins the Bunhead Bros to gab all about Ep 7 of Bunheads, What's Your Damage Heather? Stacey Oristano (@staceyoristano) joins the Bunhead Bros to gab all about Ep 6 of Bunheads, Movie Truck! Ross Kimball (@merosskimball) joins the Bunhead Bros to gab all about Episode 5 of Bunheads, Money For Nothing! Anthony Troli (@anthonytroli) joins the Bunhead Bros to gab all about Ep 4 of Bunheads, Better Luck Next Year! Louis Peitzman (@louispeitzman) joins the Bunhead Bros to gab all about Episode 3 of Bunheads, Inherit the Wind! Ben Schwartz (@rejectedjokes) joins the Bunhead Bros to gab all about the first episode of Bunheads! Matt Mira and Ben Siemon (@mattmira & @BenjaminJS) join the Gilmore Guys to prep for Bunheads and hear your questions all about Gilmore Girls: A Year in the Life! Vanessa Marano (@VanessaMarano) joins the Gilmore Guys to gab all about her time on Gilmore Girls and beyond! Sarah Heyward and Aisha Muharrar (@shinyunicorn @eeshmu) join the Gilmore Guys to discuss episode 4 of Gilmore Girls: A Year in the Life, Fall! Jason Mantzoukas joins the Gilmore Guys to gab all about Episode 3 of Gilmore Girls: A Year in the Life, Summer! Alice Wetterlund (@alicewetterlund) joins the Gilmore Guys to gab all about Episode 2 of Gilmore Girls: A Year in the Life, Spring! Gilmore Girls: A Year in the Life is here! Ross Kimball & Brock Wilbur (@merosskimball & @brockwilbur) join the Gilmore Guys to talk about gut reactions to the new episodes! Aisha Muharrar (@eeshmu) joins the Gilmore Guys to gab all about Episode 722 - Bon Voyage! Jason Mantzoukas joins the Gilmore Guys to gab all about Episode 721 - Unto The Breach LIVE in Los Angeles! The Gilmore Guys are LIVE in Nashville gabbing all about Episode 720 - Lorelai? Lorelai? The Gilmore Guys take to Boulder, Colorado to discuss Gilmore Girls episode 719 - It’s Just Like Riding a Bike! Sarah Heyward (@shinyunicorn) joins the Gilmore Guys to gab all about Episode 719 - It’s Just Like Riding a Bike! Alice Wetterlund (@alicewetterlund) joins the Gilmore Guys to gab all about Episode 717 - Gilmore Girls Only LIVE in Toronto Canada! Mara Wilson (@MaraWilson) joins the Gilmore Guys to gab all about Episode 716 - Will You Be My Lorelai Gilmore? LIVE in New York City! Gilmail Vol. 23 - "Lorelai is Cheesecake Factory"
Kevin & Demi are about to hit the road but before they do they gotta answer some questions and listen to some voicemails! David Sutcliffe (@SutcliffeDavid) joins the Gilmore Guys to talk all about Gilmore Girls and beyond! Check out Guy's album Effable, available on iTunes and Spotify! Ben Siemon (@BenjaminJS) joins the Gilmore Guys to go through your emails, voicemails, and even call some listeners back in a very unobtrusive, not at all weird way! The Gilmore Guys go through your voicemails, emails, settle the Jane Austen debate and recast the entire show in a slightly different light! Emily Kuroda joins the Gilmore Guys to gab all about her time on Gilmore Girls and beyond! Gilmail Vol. 18 - "Stefon Goes to Stars Hollow"
Kevin & Demi go through emails, voicemails, and accidentally find what Demi might generously call "the perfect joke"
Brock Wilbur (@brockwilbur) joins the Gilmore Guys to gab all about Episode 708 - Introducing Lorelai Planetarium. Kevin & Demi gab all about Episode 707 - French Twist LIVE in Boston at the Wilbur Theater! Gilmail Vol. 15 - "What Was The Question?" Keiko Agena (@KeikoAgena) joins the Gilmore Guys to gab all about Gilmore Girls and some other stuff! Gilmore Gabs - Scott Patterson Returns! Scott Patterson (@ScottGPatterson) joins the Gilmore Guys once again to gab all about Gilmore Girls and some other stuff! Jason Mantzoukas (not on Twitter, guys) joins the Gilmore Guys to gab all about Episode 621 - Driving Miss Gilmore LIVE at the Regent in Los Angeles! Milo Ventimiglia (@MiloVentimiglia) joins the Gilmore Guys to gab all about his time as Jess Mariano on Gilmore Girls and beyond! Matt Mira (@mattmira) joins the Gilmore Guys once again to gab all about Episode 619 - I Get a Sidekick Out of You! Ross Kimball (@merosskimball) joins the Gilmore Guys to gab all about Episode 613 - Friday Night's Alright for Fighting LIVE in Chicago! Jo Feldman (@hellojofeldman) joins the Gilmore Guys to gab all about Episode 612 - Just Like Gwen and Gavin LIVE in Chicago! The Gilmore Guys listen to voicemails and read emails again! For like the 14th time! Brandi Brown (@ItsTheBrandi) joins the Gilmore Guys to gab all about Episode 611 - The Perfect Dress LIVE in Minneapolis! Michael Winters (Taylor Doose) sits down with the Gilmore Guys to gab all about his time on Gilmore Girls! Ian Karmel (@iankarmel) joins the Gilmore Guys to gab all about Episode 610 - He's Slippin' 'Em Bread...Dig? LIVE in Los Angeles! Hrishikesh Hirway (@HrishiHirway) joins the Gilmore Guys to gab all about Episode 609 - The Prodigal Daughter Returns! Jamie Woodham (@jwoodham) joins the Gilmore Guys to go through your emails and voicemails! Brock Wilbur (@brockwilbur) joins the Gilmore Guys to talk all about the events, news, thoughts, and predictions surrounding the upcoming revival episodes of Gilmore Girls! Liz Torres joins the Gilmore Guys to gab all about her time on Gilmore Girls and beyond! Sarah Heyward & Sarah Ramos (@shinyunicorn & @sarahram0s) join the Gilmore Guys to gab all about Episode 605 - We've Got Magic To Do. Chris Cubas (@ChrisCubas) joins the Gilmore Guys to gab all about Episode 601 - New and Improved Lorelai LIVE from the Texas Theatre in Dallas, TX! Pete Holmes (@peteholmes) joins the Gilmore Guys to gab a little bit about Episode 506 - Norman Mailer, I'm Pregnant! Jackie Kashian (@jackiekashian) joins the Gilmore Guys to gab all about Episode 520 - How Many Kropogs to Cape Cod? 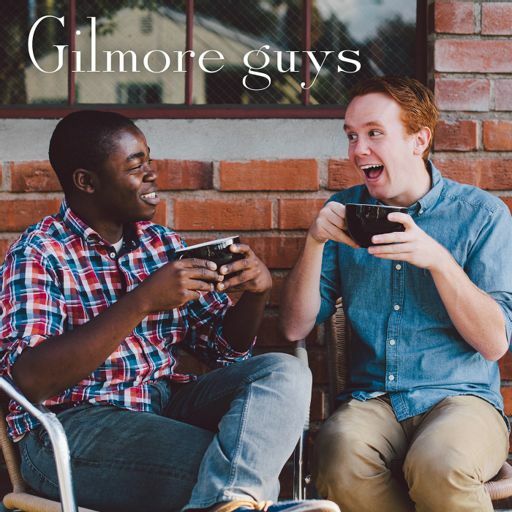 In their silliest installment yet, the Gilmore Guys go through your voicemails, e-mails, and an Alexis Bledel music video! Sarah Heyward (@shinyunicorn) joins 1/2 of the Gilmore Guys for a SPOILER FILLED DISCUSSION and also to go through voicemails and emails! Aisha Muharrar and & Ben Epstein (@eeshmu & @benmepstein) join 1/2 of the Gilmore Guys to go through voicemails, emails, and just gab it up. Brock Wilbur (@brockwilbur) joins the Gilmore Guys LIVE in San Francisco at the Great American Music Hall to gab all about 514 - Say Something. Special thanks to Kyle Maack for shooting the video podcast. Yanic Truesdale joins the Gilmore Guys to gab all about his time on Gilmore Girls! On their 3rd call-in show, the Gilmore Guys talk to the listeners all about moments, precious and otherwise and pitch a seriously legit buddy-cop show starring Kelly Bishop and Jessica Lange! On today's Gilmail Guys we play your voicemails, read your emails, and do some audio commentary! Gilmore Girls writer Sheila Lawrence joins the Gilmore Guys to gab all about her time on Gilmore Girls! Paul F. Tompkins (@pftompkins) joins the Gilmore Guys LIVE at UCB Sunset in Los Angeles to gab all about Episode 507 - You Jump, I Jump, Jack! Allie Goertz (@alliegoertz) joins the Gilmore Guys once again to gab all about Episode 505 - Norman Mailer, I'm Pregnant! Liza Weil (@liza_weil) joins the Gilmore Guys to gab all about her time on Gilmore Girls! Kevin & Demi gab all about Episode 504 - Tippecanoe and Taylor Too LIVE from the World Cafe Live in Philadelphia! Pamela Ribon (@pamelaribon) joins the Gilmore Guys to gab all about Episode 502 - A Messenger, Nothing More. Alex Goldman (@AGoldmund) joins the Gilmore Guys to dig into the mailbag and voicemails and gab all about Gilmore Girls. Wayne Wilcox (@waynewilcox) joins the Gilmore Guys LIVE at the UCB Chelsea in New York City to read the lost scripts of Gilmore Girls! Aisha Muharrar, Mike Dicenzo, and Mara Wilson join the Gilmore Guys for a live taping from the Bell House in Brooklyn NY of Episode 421 - Last Week Fights, This Week Tights. Aisha Muharrar, Sarah Heyward, and Michael Ausiello join the Gilmore Guys for a live taping from the Bell House in Brooklyn NY of Episode 420 - Luke Can See Her Face. Call My Name Vol. 2 - Advice! On today's call-in show we talk to listeners and give our incredibly qualified advice regarding life, jobs, relationships, and occasionally talk about that TV show with the chicks in it. Ben Siemon (@BenjaminJS) joins the Gilmore Guys to gab all about Episode 419 - Afterboom. Sean Clements (@seanclements) joins the Gilmore Guys once again to gab all about Episode 418 - Tick, Tick, Tick, Boom! Keiko Agena, Stacey Oristano, and Sarah Ramos join the Gilmore Guys LIVE in ATX to gab all about Episode 414 - The Incredible Shrinking Lorelais. The Gilmore Guys go through the mailbag and play some listener voicemails and WB promos as well. This is a very literal description. Jane Espenson (@janeespenson) joins the Gilmore Guys to gab all about her time writing on Gilmore Girls! The casting directors of Gilmore Girls, Mara Casey (@maracaseyshoots) & Jami Rudofsky join the Gilmore Guys to gab all about their time on the show! Anthony Troli (@anthonytroli) joins the Gilmore Guys once more to gab all about Episode 404 - Chicken or Beef? Scott Patterson (@SPatterson111) joins the Gilmore Guys to gab all about his time on Gilmore Girls as Luke Danes! Dominic Dierkes (@dominicdierkes) joins the Gilmore Guys to gab all about Episode 403 - The Hobbit, the Sofa, and Digger Stiles! Patrick Walsh (@thepatrickwalsh) joins the Gilmore Guys once again to gab all about Episode 402 - The Lorelais' First Day at Yale! Jeff Hiller (@boomboomhiller) joins the Gilmore Guys once again to gab all about Episode 401 - Ballrooms and Biscotti! Adam Wylie (@thisisadamwylie) joins the Gilmore Guys to gab all about his time on Gilmore Girls in the role of Brad Langford! Allie Goertz (@alliegoertz) joins the Gilmore Guys again to gab all about Episode 321 - Here Comes the Son! Ben Siemon (@benjaminjs) joins the Gilmore Guys once again to gab all about Episode 319 - Keg! Max! The Gilmore Guys fly solo to gab all about Episode 318 - Happy Birthday, Baby! Louis Peitzman (@louispeitzman) joins the Gilmore Guys again to gab all about Episode 317 - A Tale of Poes and Fire! Sarah Ramos (@sarahram0s) joins the Gilmore Guys to gab all about Episode 310 - "That'll Do Pig"
Today on Gilmore Gabs we talk to Matt Jones (Breaking Bad, Mom) all about getting his first gig on Gilmore Girls! Sarah Heyward (@shinyunicorn) joins the Gilmore Guys to gab all about Ep 309 "A Deep Fried Korean Thanksgiving"
In this bonus ep the Gilmore Guys open up the mailbag and see what's happening. Also, Brenda Szwejbka provides an UNBELIEVABLE song at the end of the episode. Jamie Woodham (@jwoodham) joins the Gilmore Guys to gab all about Ep 308 - Let the Games Begin! Jason Mantzoukas joins the Gilmore Guys to gab all about Ep 307 - They Shoot Gilmores, Don't They? Hayes Davenport (@hayesdavenport) joins the Gilmore Guys to gab all about Ep 305 - Eight O'Clock at the Oasis. Anthony Troli (@anthonytroli) comes back for a sweet threepeat to gab all about Ep 304 - One's Got Class and the Other One Dyes. The Gilmore Guys gab all about Ep 303 - Application Anxiety. California here we come. Elizabeth Laime (@totallylaime) joins the Gilmore Guys to gab all about Ep 302 - Haunted Leg. The Gilmore Guys get together to gab all about Ep 301 - Those Lazy-Hazy-Crazy Days. This episode of Gilmore Guys is dedicated to Harris Wittels. Harris Wittels, we love you. Rest in peace. The Gilmore Guys gab all about Ep 220 - Help Wanted. This description is both true AND accurate. Sean Clements (@SeanClements) joins the Gilmore Guys to gab all about Ep 219 - Teach Me Tonight. In their shortest episode yet, the Gilmore Guys read more of your emails! That's all! The Gilmore Guys are back in the saddle again to gab all about Ep 218 - Back In The Saddle Again. Hey, that's a cool coincidence! Allie Goertz (@alliegoertz) returns to Gilmore Guys to gab all about Ep 217 - Dead Uncles and Vegetables. Neil Campbell (@neilerdude) joins the Gilmore Guys to gab all about Ep 216 - There's The Rub. The Gilmore Guys gab all about Ep 215 - Lost and Found, AMONG OTHER THINGS. The Gilmore Guys gab all about Ep 214 - It Should've Been Lorelai. Julieanne Smolinski (@BoobsRadley) joins the Gilmore Guys to gab all about Ep 213 - A-Tisket, A-Tasket! Patrick Walsh (@thepatrickwalsh) joins the Gilmore Guys to gab all about Ep 212 - Richard in Stars Hollow. Special bonus extended rap at the end. Ben Siemon (@benjaminjs) returns a converted Gilly to gab with the Gilmore Guys all about Ep 211 - Secrets and Loans. The Gilmore Guys fly solo bolo in this ep to gab all about Ep 210 - The Bracebridge Dinner. Rory wants to build a snowman. In this episode we reflect on some of our favorite Richard Gilmore moments and remember the man that brought him to life. Edward Herrmann, you will be greatly missed. The Gilmore Guys close out 2014 with their last episode of the year and gab all about Ep 209 - Run Away, Little Boy. Farewell forever, Chad Michael Mudface. The Gilmore Guys see what's itching in the mail bag this week from all the fans, because it's ALL about the fans. Also they're very literally sick and tired. Jeff Hiller (@boomboomhiller) joins the Gilmore Guys to gab all about Ep 207 - Like Mother, Like Daughter! In their first ever bonus episode, Kevin and Demi go through all the thousands of listener emails they've received and read them, out loud too! Because at the end of the day, it's all about the fans babyyyy. Brian Huskey (@thebrianhuskey) joins the Gilmore Guys to gab all about Season 2 premiere episode 201 - Sadie Sadie. Listen to Brian talk about doing DB's with SP. Allie Goertz (@alliegoertz) joins the Gilmore Guys for a bit of a shorty ep to gab all about Episode 119 - Emily in Wonderland. Krista Doyle (@Krista_Doyle) joins the Gilmore Guys to gab about Episode 118 - The Third Lorelai. Trix is never going to die, she's too stubborn! In their most overbloated episode yet, Kevin and Demi discuss Eps 116 and 117 - Star-Crossed Lovers and Other Strangers and The Breakup, Part II. There's actually lot of rapping in this one. Jamie Woodham (@jwoodham) joins the Gilmore Guys to gab about Love and War and Snow.